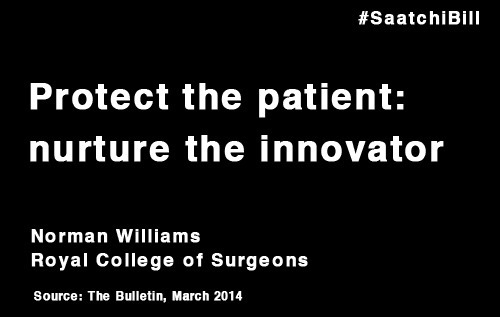 ‘Protect the patient: nurture the innovator’ writes Norman Williams, President of the Royal College of Surgeons (RCS) in the March 2014 RCS bulletin. A few weeks ago I spent the weekend in Innsbruck, participating with several European colleagues in a surgical workshop that concentrated on a new minimally invasive technique of sphincter preservation in rectal cancer. This innovation has the potential not only to reduce the incidence of permanent stomas significantly but to do so with the minimum of trauma. It occurred to me and my fellow participants that it might also, if developed appropriately, be possible to carry out the whole procedure via one orifice – no prizes for guessing which one! I also thought that if robotics develop at the estimated pace then the technique could be performed with even more precision, thus reducing the margin of error inherent in such an operation. Now, I know many of you will be thinking that the President is in ‘cloud cuckoo- land’ but I would like you to reflect on the considerable progress we have made in surgery over the past 50 years. When I was a medical student there was no such thing as organ transplantation, cardiac surgery was in its infancy, joint replacement had just been introduced (but only for hips), and laparoscopic and microsurgery were both at a very rudimentary stage. The pace of innovation has been truly remarkable and yet we in the UK could be criticised for dragging our heels when it comes to the dissemination of some developments. Four years ago, when I was Chairman of the RCS Research Board, we published a report entitled From theory to theatre, in which we explored the barriers to translational research that threatened to stifle surgical innovation and identified a series of actions to deliver high-quality surgical research now and in the future. I am pleased to say the College rose to the challenge and, in addition to raising funds and influencing research councils and charities, has managed to develop an infrastructure that should markedly change for the better the way in which we carry out clinical surgical research. All in the research and development departments should be congratulated on their achievements. I should also compliment the many surgical trainees who have contributed their time and efforts to developing trainee research collaboratives. There are more than 20 of these across the country, each carrying out some large clinical trials and audits as they try to answer important questions. All these efforts are to be applauded and celebrated but the challenges do not stop there. The fruits of research are of little value if they are poorly implemented. Discovery only matters if it reaches all those patients who might benefit. The diffusion of surgical innovation has at times been painfully slow. The reasons are many, ranging from lack of evidence to training and capacity issues. We hope we are beginning to address some of these barriers with the actions mentioned above but others will require different solutions. If we are to tackle the slow diffusion of innovation then we must learn from experience and not keep making the same mistakes. That is why we commissioned a piece of work to investigate how we might improve. The report of this investigation, entitled From innovation to adoption: Successfully spreading surgical innovation, will be published soon. It sets out for the first time what makes adoption of surgical innovation different and why we need a new approach. These are vital factors if we are to achieve a more streamlined adoption mechanism but in addition I must stress that there is a responsible and ethical approach. This applies particularly at the earliest stages but of course must be applied throughout the whole process. There is no room for ‘cowboys’ or the ‘have-a-go’ merchant. My memory goes back to the early 1990s when a news conference was held at the College about the death of a patient that occurred at the hands of a surgeon performing an early laparoscopic procedure without appropriate governance arrangements in place. The patient’s husband was a QC and the subsequent fallout was disastrous for the profession and set back laparoscopic abdominal surgery in the UK for a decade. Although governance has improved, a clear path showing how to support the innovator, while at the same time protecting the patient, is still lacking. We need a transparent and supportive mechanism to assist the innovator in honing a truly new concept without the constant fear of litigation (or worse). Yet at the same time safeguards need to be in place so that patients are fully informed and protected from the unscrupulous practitioner. This will not be easy but it is an issue that can no longer be avoided, otherwise it is only a matter of time before one of us is incarcerated for trying to advance his or her specialty. I understand that several consecutive patients died when Professor Sir Roy Calne carried out the first liver transplants; I wonder what would happen to him nowadays were there to be a similar outcome. Complications are inevitable with new procedures and only by facing up to them and understanding them can they be overcome. This requires courage on behalf of the innovator (and, indeed, the patient) and support from colleagues. Research ethics committees have their place but they are invariably composed of non-surgeons who do not have an appreciation of the problems. I would like to see our profession taking on this responsibility. One way to do this might be for each specialty association to set up an Innovation Oversight Panel composed of individuals with experience of the trials and tribulations involved in surgical innovation. Such a panel could receive proposals for innovative procedures to assess whether or not they were feasible, appropriate and designed to improve the status quo. The panel could then give approval for a small pilot study but request regular reports, so that when complications occurred they could help the innovator to resolve the particular issue. The process would be iterative and hopefully the new procedure would evolve so the trial could be widened to involve other groups. Ideally this would take place within the infrastructure discussed above to ensure more rapid dissemination. Such a structure would enable the realisation of this piece’s title and is in keeping with the new Medical Innovation Bill promoted by Lord Saatchi, which is designed to improve responsible innovation in medicine and remove the fear of litigation. I would exhort the officers of the specialist societies to think seriously about setting up an appropriate mechanism. It does not need to be the model I have outlined; they may well feel they could do better and I would be the first to applaud them. However, unless a mechanism of some form is set up I fear that the progress of surgical innovation may be impeded by the imposition of stringent external regulation. I also fear that patients will be damaged unnecessarily and surgeons will be impugned or, at worst, indicted. Unless potential developments like the one I learnt about in Innsbruck can be developed speedily yet ethically, then disseminated appropriately, we are all the losers.